Originally a mill workers cottage, 34 Water Lane is a delightful three storey, two bedroom, grade II listed cottage set in the hillside in the pretty historic village of Cromford. 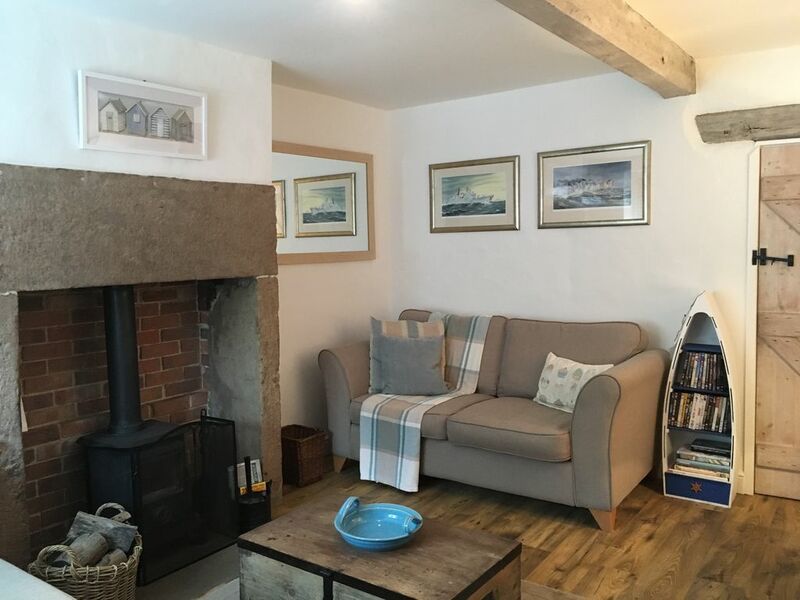 The cottage has many original features, including grit stone fire surrounds in the lounge and each of the two bedrooms, beams and exposed stone walls. The cottage is beautifully decorated and furnished throughout in blues, greys and beiges - with water themed decorative finishes. The lounge offers the opportunity to relax on one of it's two two seater settees. Watch TV or a DVD leisurely - or just enjoy relaxing whilst you savour the ambience! A selection of games, books and DVD's are provided to assist in your endeavours! However, should you wish to 'touch base' with your on-line friends, wifi facilities are available at the cottage. Off the lounge there is a small cloakroom offering a toilet and washbasin as well as an area to hang your coats and boots/shoes - so that you can enjoy a clutter free stay. This area also accommodates an iron/ironing board, vacuum cleaner, brush, mop and bucket etc - but more importantly....a small picnic bag - ideal for day's out. Also off the lounge is a thumb latch door which provides access to a delightful kitchen/diner. The modern cool grey shaker style kitchen is fitted with a built-in oven and modern electric hob over which is an extractor fan. The kitchen also offers a built-in dish washer and a refrigerator with freezer box - all designed to ensure your stay is effortless! The kitchen holds everything you would need for a stay at this delightful cottage - but if you think anything is missing - please let the owner know. A door from the kitchen gives access to the terraced garden - via steep stone steps which can be slippery when wet..
From the lounge there is also a thumb latch door leading to the original steep and narrow staircase giving access to the upper floor. Please note that although 'quaint' the stairs may present a challenge for those who are less agile than they would like to be or have mobility issues. The first floor landing gives access to the first of two double bedrooms. This room combines modern day luxury with some of the properties most endearing original features. These include original wide planked wooden flooring, a gritstone fireplace and stone mullion windows. The bedroom offers a king-sized bed, bedside tables, a double wardrobe, dressing table and a chair from which you can enjoy views across to the millpond opposite. Be-decked in cool greys, yet furnished in rich chestnut brown wooden furniture, the room offers a tranquil setting in which to relax after enjoying the sights of the region. Further up the stairs, the top floor landing provides access to a second double room. The stripped pine furniture combined with soft furnishings with copper accents provides another room in which to rest and relax. A double bed, two bedside tables and a chest of drawers gives adequate storage space, whilst two chairs allows you the opportunity to relax and enjoy a rest. Original wide plank flooring and a small gritstone fire place gives a 'nod' to the historical nature of the property. Next to the second bedroom and also on the top floor of the property is a beautifully finished, recently fitted shower room. Offering a walk-in shower, vanity unit, heated towel rail and views over the rear terraced garden - bathing couldn't be more enjoyable! Outside and to the rear of the property and built into the steep hillside lies two terraces from where views across open countryside can be enjoyed. A peaceful retreat after a day's sightseeing! Please note however, the stone steps are steep and may present a challenge for those less agile. Furthermore, the land and terraces to all properties in the row of cottages are open, as the steps built into the hillside provide share access. Heating and hot water in the property is provided via a central heating system operated by a combi-boiler. In addition, as already mentioned, a log burning stove is located in the lounge for those chilly evenings. A basket of logs and fire lighting facilities are provided for guests and the cost of gas and electricity is included in the hiring charge for use of the cottage. Like most village based small cottages, there is no dedicated off-road parking attached to this property. Free on-road parking however is available opposite the cottage. As already mentioned, 34 Water Lane is an original mill workers cottage. The village itself houses the first ever water powered cotton mill. Built by the inventor and entrepreneur Richard Arkwright, the mill itself is a 15 minute walk from the cottage. Now converted to a tourist attraction, the mill offers shops and tea rooms set in the original mill buildings. Next to this mill is a pretty canal offering barge trips, gift shops and a tea room - as well of course as a delightful path along the canal on which to walk and enjoy nature at it's finest! But Cromford doesn't just offer these two key attractions. Opposite 34 Water Lane is another mill - now converted to residential accommodation. A public footpath takes you over the river next to the mill and along a river path towards Middleton. There are also gift shops, tea room and art galleries in the village. Other historical features can also be found in Cromford - but I'll let you discover them yourselves! 1. Matlock Bath - a small and lively town located on the River Wye, which offers tea rooms, gift shops, Heights of Abraham cable car ride and Gulliver's Kingdom as well as picnic areas by the river is approximately 1 mile away from Cromford - easily walkable but equally accessed within five minutes by car. 2. Matlock - another small town packed full of tea shops, gift and antique shops. Again located on the River Wye this thriving little town is a must see for visitors. Matlock is located approximately 2.5 miles from Cromford and would take approximately 10 minutes to reach by car. 3. The little village of Wirksworth is located approximately 2 miles from Cromford and offers further tea/coffee shops, gift shops and pretty houses and walkways. 4. Travelling a little further afield, Chatsworth House and gardens are located 10 miles away and can be reached by car within 30 minutes. The house, gardens and grounds are certainly a 'must see' visitors attraction. And you may be fortunate enough to see a herd of deer or two in the grounds of the estate. 5. Also a little further away is the delightful town of Bakewell. Famous of course for it's Bakewell Pudding - visitors can enjoy looking around delightful shop, tea or coffee in one of it's myriad of tea and coffee shops. Also located on the River Wye, the town offers delightful riverside walks and picnicking areas. As you can see, as well as Cromford itself, the area offers much to the discerning visitor. Enjoy your stay! I took early retirement from work in education (FE) a few years ago, deciding to allow time for me to indulge my passion - renovating and furnishing little houses for use as holiday lets! After successfully offering a small cottage on the east coast as accommodation for holiday makers, I decided to purchase a property a little nearer my home town in Yorkshire. Being near the coast was lovely but a bit of a track when things went wrong. This house in Cromford became available and, as I've always liked the village and it's surrounding area, I decided to buy it and offer it to holiday makers. I love the history behind both the cottage (Grade II listed mill workers cottage) and the village of Cromford itself, and I've regularly visited the surrounding area, which offers so much in terms of natural beauty and attractions. I've a bit of a 'thing' about little houses in need of a bit of TLC and so had the pleasure of renovating and decorating this one in a way that I liked. I don't just like it now - I love it and hope those who enjoy a stay there feel the same! 34 Water Lane is located on the edge of an interesting and historical village - but not just a typical tourist village. This village has a beating heart and soul. It has a community that lives and works in the village. Within a few minutes walk, guests at the cottage can visit one of several local pubs, shops, restaurants, art galleries and coffee shops. Slightly further afield guests are spoilt for choice regarding places of interest to visit. It really is an ideal place to stay. The newly fitted modern shower room offers a walk-in shower, vanity unit and toilet. Spacious enough yet cosy and decorated in shades of grey and white. Toiletries (hand wash, shower gel, body lotion, shower caps) are provided as are towels - co-ordinating in colour with each of the two bedrooms. A heated towel rail its provided as is plenty of space to keep those all important wash bags. The property is heated via a gas central heating system which also provides the hot water for the property. All bedding is provided in both bedrooms. A fire place with a log burning stove is provided in the lounge. The cottage does not have any dedicated off-road parking however, parking is available on the road opposite the cottage. A log burning stove is available and a basket of logs as well as fire lighting facilities are provided. The lounge offers two two seater settees, a coffee table, cupboards and shelves on which can be found a TV with built in DVD player, games and books. A selection of DVD's is also provided. The kitchen has a built in dishwasher. A built in fridge with freezer box is provided. The kitchen has a built in four ring electric hob. An electric built under oven is provided. A work top microwave oven is provided for use by guests. An iron and ironing board as well as brush, brush and pan and vacuum cleaner can be found in the under stairs cloakroom. A tea towel, hand towel, pan scrub and dishcloth will be provided for guests. Crockery, cutlery, saucepans, dishes and utensils are provided. In addition, facilities for picnicking are provided (picnic blanket, basket, plastic crockery and cutlery). The cottage has grey shaker style kitchen consisting of wall and floor units, built in cooker/hob/extractor hood, dishwasher and fridge with freezer box. The room has a dining table and four chairs. A table and four chairs can be found in the dining kitchen. TV with build in DVD player and radio is provided. A selection of books is provided. A selection of games is provided. A small, hillside garden with two terraces is located to the rear of the property. The rear garden, which is built into the hillside, has two terraces. A table and four chairs is located on one whilst a bistro table and two chairs is on the second. Both are access via steep steps. As the cottage is an original mill workers property built over 200 years ago, the stairs and the external steps to the garden terraces are both narrow and steep. Less mobile/agile guests may find these a challenge. The cottage was beautifully clean, tidy and well appointed. to eat and drink. We were not walking but the location was ideal for driving to various places. The only drawback with cottage was the stairs inside and the steps in the back garden. Apart from that the cottage was ideal. Thank you so much for writing a review following your stay at my cottage in Cromford. I’m really glad you enjoyed your time there. The internal and external stairs are the original stairs to the old cottage and are steep and narrow. I find they add to the charm of the cottage but I agree they can be a challenge for those who are less agile. Beautiful, comfortable and well equipped. Everything was of very good quality and extremely tastefully decorated. Comfortable beds, good shower, very clean everywhere, Ambling distance to the lovely Boat Inn for fab lunches and lazy evenings on the sofa made it a very relaxing break. We enjoyed the sunshine in the terraced garden too. No issues with steps inside or out but can see why it says no children under 12. Will definitely book again! We loved it. Thank you so very much for taking the time to write a review - and such a positive one - following your stay at my cottage in Cromford. I'm so glad you enjoyed your visit and found the cottage to your liking and really appreciate your feedback. I was going to contact you anyway to say a huge 'Thank You' for leaving my cottage in such a lovely condition - it hardly looked used! Once again - thanks for booking my cottage. My niece & I had a very comfortable & relaxed stay at Chris' Cromford cottage. Everything we needed for cooking & cleaning was at hand in the cottage and the beds were extremely comfortable and cosy adding to the all round cottage comfort which meant we both got a very good night's sleep. Thank you Chris for equipping the cottage so well and making our stay so enjoyable. Thank you so much for taking the time to write a review following your stay at my cottage - and a very positive review too! I'm really pleased to hear you enjoyed your stay and that the cottage provided everything you needed . Glad you found the beds were comfy too! Perfect place for a break. This lovely cottage is perfect in every way. The lounge with its log burner and two couches is a great place to relax after a day out walking in the beautiful local countryside. The two bedrooms are cosy and the beds really comfortable. There is a well appointed bathroom with a large shower, and the kitchen has everything you could possibly need. We felt at home as soon as we arrived, and despite the cold March weather we were warm and cosy throughout our stay. Thank you so much for posting such a brilliant review about my cottage in Cromford! I'm really glad you enjoyed your stay and that the cottage and it's surroundings were as you'd hoped for. Once again - thanks for booking my cottage and for posting such a lovely and comprehensive review. The cottage is very cosy, it's quite small but makes good use of the space. The location is very picturesque and close to the bookshop, crafts mill and Boat Inn pub in Cromford. There's easy access to drive into the peak district and scope for going on some nice rural walks directly from the cottage. We were slightly confused by the nautical decor, being so far from the sea, but that aside the cottage was clean and nicely furnished. I'd add that having an allocated parking space near the cottage was very useful. Thank you so very much for taking the time to write such a positive review following your stay at my cottage in Cromford. Yes - you're right about the 'nautical' theme! I used to have a cottage on the east coast and thought I'd use some of the items I had there to create a similar affect. I thought I might just get away with it as the cottage is located on 'Water' Lane.....! Immaculate house with beautiful furnishings. Lounge was really comfy - sofa especially so! Great log burner that kept the room super warm over NEw Years. Great kitchen amenities including really decent oven. Comfy bed, with soft linens. And new looking bathroom including walk in shower. The whole house looks like it was very recently redone to a very high standard, whilst retaining its charm and character. Cromford itself is a beautiful village, decent pub a few minutes walk away and The Greyhound is a great spot for a fantastic Sunday roast. We also did a walk up to Black Rocks and then down to the canal and through fields - starting and finishing in Cromford - beautiful scenery! Chris was a super star - she went over and above to make our stay comfortable and enjoyable - including sending my mobile phone back to me after leaving it in the cottage!! Thank you so very much for taking the time to write such a comprehensive and positive review of my cottage in Cromford - and the surrounding area. I'm really pleased you enjoyed your stay. And returning your mobile 'phone was absolutely no problem at all! Thanks once again for booking my cottage. Cromford is located in an area renowned for it's tourist attractions - at Matlock, Matlock Baths, Bakewell, Chatsworth House - as well as Cromford itself offering attractions such as canal trips and the Cromford Mill complex. As already mentioned, 34 Water Lane is an original mill workers cottage located on one of the two main roads passing through Cromford - both of which do experience a degree of traffic. The village itself houses the first ever water powered cotton mill. Built by the inventor and entrepreneur Richard Arkwright, the mill itself is a 15 minute walk from the cottage. Now converted to a tourist attraction, the mill offers shops and tea rooms set in the original mill buildings. Next to the mill is a pretty canal offering barge trips, gift shops and a tea room - as well of course as a delightful path along the canal on which to walk and enjoy nature at it's finest! But Cromford doesn't just offer these two key attractions. Opposite 34 Water Lane is another mill - now converted to residential accommodation. A public footpath takes you over the river next to the mill and along a river path towards Middleton. There are also gift shops, tea room and art galleries in the village. Other historical features can also be found in Cromford - but I'll let you discover them yourselves!